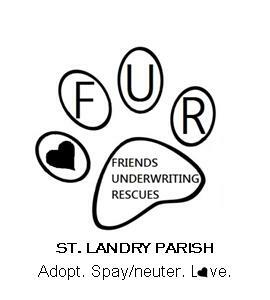 FUR (Friends Underwriting Rescues) is a 501(c)3 nonprofit organization whose mission now is to help St. Landry Parish Animal Shelter give its animals quality care and comfort. With gifts of supplies and financial support gathered through fundraisers and donations, we look to our long-term goal: helping the shelter increase the animals’ chances for adoption and transport to other adoption organizations. increase public education about humane practices. encourage people to adopt pets from shelters rather than purchase them from breeders. When you adopt an animal, you give a shelter pet a home and create a space for another homeless animal. encourage and facilitate spay/neuter responsibility and awareness. To stay up-to-date on events, success stories, and adoption opportunities, follow FUR on Facebook! Visit the St. Landry Parish Animal Shelter Facebook page, or visit the animals and staff in person at 225 Hanger Road, Opelousas, Louisiana 70570. You can call (337) 948-6184 about adopting an animal, and email stlandryanimalshelter@hotmail.com.